AESSEAL® cartridge mechanical seals are used in a wide range of pumps and rotating equipment worldwide to prevent liquids and gases escaping into the environment. Here are three advantages they offer. AESSEAL® cartridge mechanical seals are pre-assembled at the factory, pressure tested and shipped as a unit. This seal configuration eliminates the requirement for seal setting measurements at installation. Spring tension is another crucial factor in a successful mechanical seal installation. With component seals, the tension must be set manually by adjusting the length of the installed seal spring. With cartridge seals, the spring tension is preset, eliminating the time and potential errors of manual installation. A retaining device holds the rotating and stationary elements in correct alignment until the seal is mounted. Having a mechanical seal pre-assembled also means that the seal faces are protected from damage during the installation process. There are options to handle the most demanding sealing applications, such as slurry applications and containment of hazardous process fluids. For unusual applications, AESSEAL® also offers a Standard Plus line that offers the benefits of a standard cartridge mechanical seal, while meeting specific customer needs. This includes competitor replacement seals, and seals designed for specific pumps and processes. Cartridge mechanical seals cost more than component seals at the outset. However, they can be a more cost-effective solution over the long term, in the form of lower maintenance costs. Potential savings come from reduced labor costs and less downtime when in-service seal replacement is required. Are you interested in improving pump reliability, increasing uptime, and reducing maintenance costs? 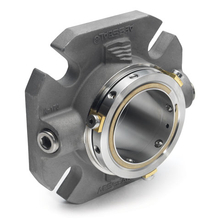 The experts at C&B can supply and help you implement the best AESSEAL® cartridge mechanical seals and seal support systems for your specific application. Contact us today.